If I have multiple cards that increase the amount of cards I draw, do they all trigger at the same time? What happens when the artifact falls off a card which is enchanted by Animate Artifact? Tried to add some more artifacts and some more firepower. I'm also thinking that these will pair well with Unwinding Clock (especially the Artifact Lands). Competitive Meter went from 76% to 78%. Chhris on Izzet Artificial Life? Yes. Yes it Is. I think in terms of upgrading. it kinda comes down to what direction you want to go in for the deck. I love Cloven Casting as a cool method for spinning tricks and spells. I also love Fevered Visions and Dictate of Kruphix as card draw that is also hard to remove as enchantments. There's also more budget options too. This is the result of my tinkering with the pre-con: Get the most out of your Myr in 3 easy steps if you want to check out any other ideas. 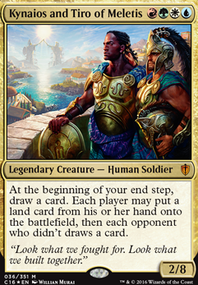 Mine is based on Brudiclad, Telchor Engineer , and creating lots of tokens, before turning all those tokens into the creature I want them to be. You don't really have the feel of a group hug deck here. A few cards you are running are group-huggish, like Veteran Explorer , Orzhov Advokist , and Kami of the Crescent Moon . Otherwise, you are running more of a pillowfort deck, where you are trying to incentivise others to attack players other than yourself. If you want to go group-hug, you should consider running cards like Rites of Flourishing , Eladamri's Vineyard , Magus of the Vineyard , Howling Mine , Noble Benefactor , Dictate of Kruphix , Awakening , and cards such as these that really benefit the rest of the table, along with yourself. Its ok to run group-hug alongside a pillowfort strategy, but you don't have much group-hug going on right now that I can see. Hi Chromebot, I love phelddagrif but this doesn't look like a group hug deck to me. You've got Dictate of Karametra and Dictate of Kruphix and Temple Bell and Rites of Flourishing , but that's about it for your group-hug package. You've also got a lot of protection like Briar Patch and Illusionist's Gambit , . I would take out some of those protection cards and add some more group hug effects like Howling Mine and Font of Mythos and Tempt with Discovery and Minds Aglow and Veteran Explorer . I would include some cards that affect all players, regardless of whose control it's under. Dictate of Kruphix , Teferi's Puzzle Box , Font of Mythos can be build-arounds for a deck playing a lot of cheap cards. 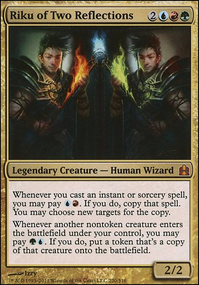 I've also heard that treating Zedruu as a Voltron commander, donating the Daybreak Coronet s and Ethereal Armor s you attach to it can be powerful. Any aura can be donated without affecting whom it benefits, though. I can see some of that with the creature removal you've chosen. 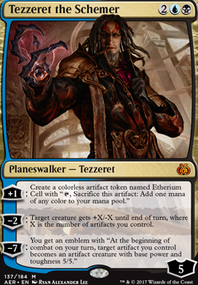 You could also go for Curses, Imprisoned in the Moon , Darksteel Mutation , Eldrazi Conscription , Overwhelming Splendor , the list goes on and on. Thanks for your feedback cdkime! a lot of solid points! I am trying to build the deck as "budget friendly" as possible as it is my first deck and I'm still not willing to invest too much into a single deck. Because of this, I think I will include Master of the Feast , Jace Beleren & Dictate of Kruphix as I have already bought these :) but I can definitely see your point and I might exclude Howling Mine and Kami of the Crescent Moon . As you mentioned i have also noticed that Nekusar without any support/extra dmg pr. card draw etc. is more harm than good. The combo you are mentioning with Temple Bell i dont quite understand, will Mind Over Matter not only untap it once, meaning i get to draw one extra card? Library of Leng seems really really good and will definitely be included! I have looked on Cyclonic Rift as well, but its too expensive atm. unfortunately. I will make a few changes to the deck in about an hour or so if you wanna take a look please do - all feedback is appreciated! This is a pretty solid start. 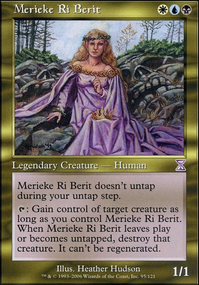 I have a couple suggestions based on my own experiences with Nekusar. 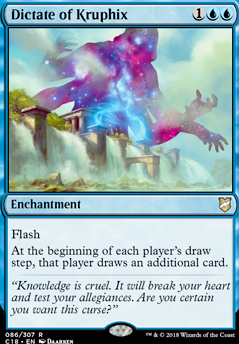 I would recommend cutting Howling Mine , Kami of the Crescent Moon , Master of the Feast , Jace Beleren and Dictate of Kruphix for a couple reasons. First and foremost, these cards put you at a competitive disadvantage. While it may seem equal, you have to think of your opponents as a collective whole. These cards allow you to draw 1 card; with three opponents, your opponents are getting 3 cards total. That increases the chance that at least somebody will have drawn into their answer. Master of the Feast is an exception, you get no cards, while your opponents get 3. That's not worth a large, flying body. 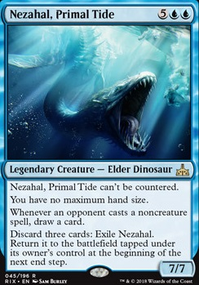 Second, Nekusar really wants large, explosive plays. Chipping away one additional generally does not make a significant difference in the game. Finally, with the exception of Dictate of Kruphix and Jace Beleren , your opponents get to take advantage of the additional card before you are granted additional cards. Not only do they put you at a long-term disadvantage, they start harming your chances of victory pretty much immediately. I would include Temple Bell on this list, but I wanted to address it separately. Temple Bell has some potential alongside Mind Over Matter , as it allows you to mill yourself to 0. Run alongside Laboratory Maniac (which you can use the combo to dig for and then cast), you can use this to win the game. Library of Leng is a powerhouse in Nekusar. You can discard the cards you do not want, but keep those you do, engineering a better hand with each wheel. Niv-Mizzet, the Firemind and The Locust God are both strong ways to capitalize on the amount of card draw you are generating. Curiosity can generate significant card advantage with Nekusar. When enchanting Niv-Mizzet, the Firemind , you can loop damage and drawing until you choose to break the loop or run out of cards. Cyclonic Rift is a pretty solid card in commander, functioning as an early-game bounce spell and a later-game method of clearing the board. I have found Sigil of Sleep to be a nifty little card, as it can turn a single wheel effect into a mini Cyclonic Rift .